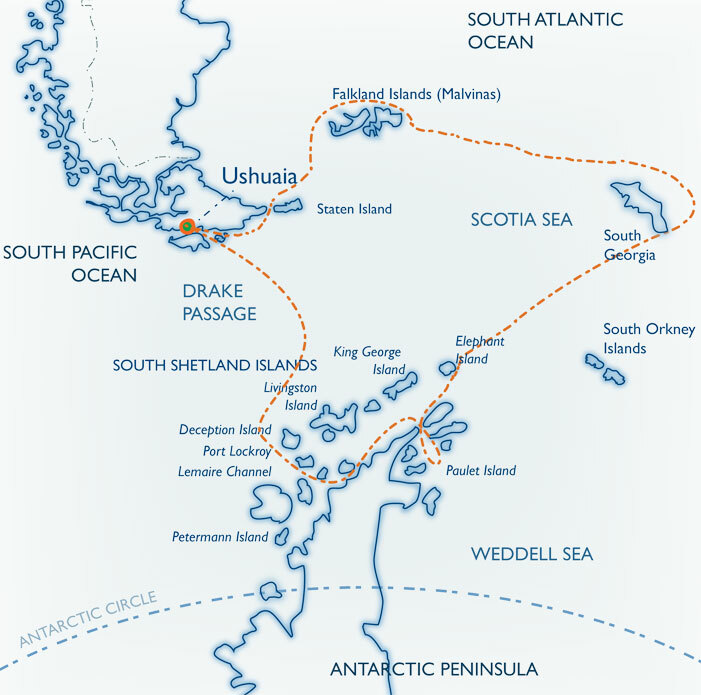 Our home as we sail, photograph, and explore Antarctica is the polar vessel Ushuaia. Originally built for the United States National Oceanic & Atmospheric Administration, the ice-strengthened polar vessel Ushuaia is very well appointed and provides ample deck space and an open bridge policy. The full complement of inflatable landing craft ensures superb landings and wildlife viewing opportunities on the otherwise inaccessible coastline. You have a choice of single cabins or sharing cabins. We can easily match you up with a great cabin-mate. All cabins include ample storage space. Public areas feature a large dining room (everyone is able to eat in one sitting), an open-plan observation lounge / lecture room with modern multimedia equipment, bar and a well-stocked library. There is also a changing room and a small infirmary with an on-board doctor. Laundry service is available. Ushuaia's expert captain, officers, and crew are highly experienced in Antarctic navigation and have a great love of nature. We provide a specialist team of photographic professionals, international expedition leaders and lecturers, all extremely knowledgeable, enthusiastic, helpful, and dedicated to the protection of the environment and your experience and photography on the expedition. Our chefs prepare excellent cuisine including many local specialties and the bar is well-stocked with carefully selected wines and spirits. Special dietary needs can be accommodated, of course! Standard Single with semi-private bathroom. 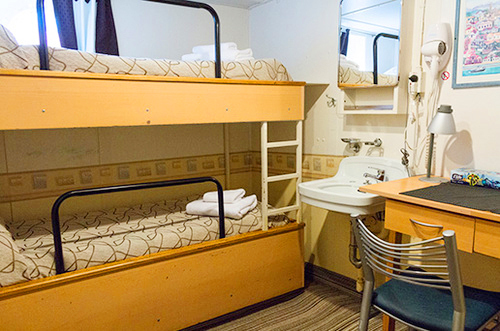 Single occupancy outside cabins on Deck E, with an upper and lower berth, wash basin, plenty of storage and desk. Each of these cabins shares an adjoining bathroom (shower and toilet) with one other cabin. Standard Single with with private bathroom. 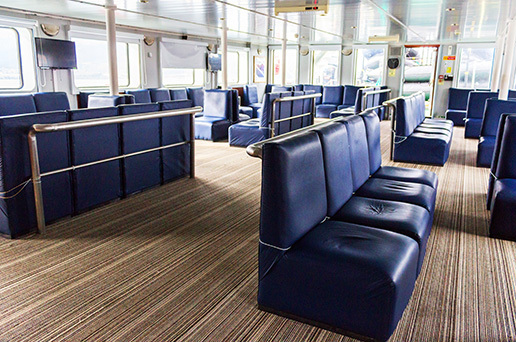 Single occupancy outside cabins with portholes or windows on Deck E, each with two lower berths, plenty of storage, desk, and private bathroom with shower, wash basin and toilet. Standard Twin Cabin with semi-private bathroom. Double occupancy twin outside cabins on Deck E, each with upper and lower berth, wash basin, plenty of storage and desk. Each of these cabins shares an adjoining bathroom (shower and toilet) with one other cabin. Standard Plus Twin Cabin with private bathroom. Double occupancy twin outside cabins with portholes or windows on Deck E, each with two lower berths, plenty of storage, desk, and private bathroom with shower, wash basin and toilet. Premier Twin Cabin with private bathroom. Double occupancy twin outside cabins with windows on upper Deck G, each with two lower berths, plenty of storage, desk, and private bathroom with shower, wash basin and toilet. These cabins are a bit larger than the Standard Plus Twin. Superior Twin Cabin with private bathroom. Double occupancy twin outside cabins with windows on upper Deck G, each with two lower berths, plenty of storage, desk, and private bathroom with shower, wash basin and toilet. These cabins are a bit larger than the Premier Twin. There are a four large outside corner double occupancy suites available, with double beds, multiple windows, sitting area, TV, DVD player, fridge and private bathroom.